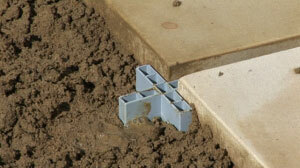 The Gapfast Cross paving spacer is suitable for Checkerboard (Stacked) Laying Patterns. 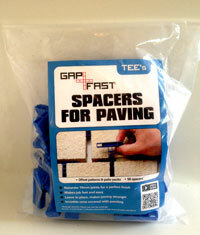 The Gapfast Tee paving spacer is suitable for Staggered (Offset) laying Patterns. Gapfast™ are a patented larger, stronger version of wall tilling spacers specifically designed to make laying paving slabs and building a patio easy. 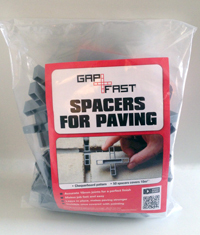 The Gapfast paving spacer provides a quick and easy method of installing all paving flags to give consistently accurate 10mm joints and to increase the structural integrity. A brand new product that will greatly assist DIY enthusiasts and skilled tradesman alike. 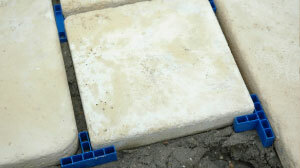 Accurate 10mm joints between patio slabs – every time! Makes it easy for DIY! Makes it fast for the professional! No more making temporary spacers! The inherent strength of the Gapfasts coupled with the fact that they will not rot or disintegrate (guaranteed 25 years) means this added structural integrity (up to 180% increase) is in effect permanent. Why do I need Gapfast? If you want to know how to lay paving slabs easily and achieve a professional finish to your patio, then you will find Gapfast invaluable. Paving manufacturers will typically specify a 10mm pointing gap between their paving slabs. If you visit your local DIY store & pick up their “how-to-lay-a-patio” or “how-to-build-a-patio” leaflet it will tell you to use 10mm spacers. Before Gapfast you would have to spend time & money making your own spacers (typically from wood). 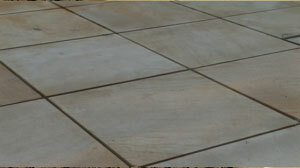 Now with Gapfast you will not only have a bespoke paving spacer but it will enhance the strength of the patio as well. Job done! Do I need Gapfast Crosses or Tees? *How many Gapfast will I need? 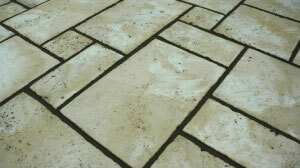 This will depend on the paving / patio slab size you are laying, the total area to be paved and lastly the laying pattern. Use our Gapfast Calculator to quickly see how many to order. 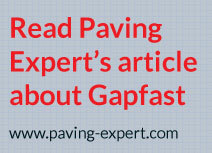 To learn more about how to lay slabs easily using Gapfast paving spacers please view our page “How to lay a patio” where you can learn the basics from preparing the base through to how to lay paving, cutting paving slabs accurately & safely and finally pointing.